In warmer climates regulating the pool temperature from getting to hot can become a problem. Water temperatures above 30 C or 86 F can become problematic. First the warm temperature is ideal for algae and other bacteria growth. Second, is that choline gases dissipate quickly with warm water and require stronger doses. More chlorine leads to uncomfortable irritation of eyes and skin. If the pool is left untreated in warm weather, then it will quickly turn to a green mess! As a rule of thumb for every 10 degrees F over 80 F, you will require 2 times as much chlorine. 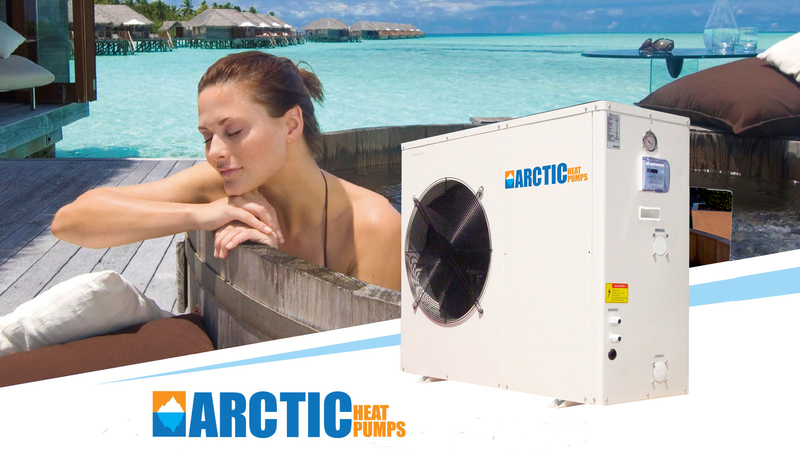 Solution – Arctic Pool & Spa Heat Pumps are “Hybrid Heaters” that heat as well as chill the water. With the automatic temperature function you can set the temperature and the pool spa heat pump will maintain the temperature by either cooling if the water exceeds the set point or heating if the water drops below the set point. Having a built-in pool chiller is a great feature for those tropical climates and will make your pool or spa that much more enjoyable. A refreshing dip in the middle of a summer heat wave is always welcomed! Because the Arctic Pool and Spa Heat Pump is based on a refrigeration cycle, it is not affected by humidity. Other pool chillers on the market relay on evaporation chilling which is ineffective in humid climates. It also uses water as its chilling source and not great for places like Arizona or California where water is a premium. Water Connection inch 1–1/2" 1–1/2" 1–1/2"
Unit Net Dimensions ( L/M/H ) inches L/W/H 44"/18.5"/27.5" 44"/18.5"/37.2" 44"/18.5"/49.2"